PREPARE MEATBALLS; GROUND BEEF, EGGS, 2 GARLIC CLOVES, BREADCRUMBS - MIX TOGETHER WITH HANDS, FORM MEATBALLS PLACE IN CROCK POT. PREPARE SAUCE; SQUEEZE TOMATOES FROM CAN OVER MEATBALLS, ADD WINE, GARLIC, SUGAR. LET COOK ON LOW FOR 7-9 HOURS. WHEN YOU'RE READY TO EAT; TURN OFF SLOW COOKER, GIVE A FEW STIRS. SLICE ROLLS, BRUSH WITH OLIVE OIL, SPRINKLE WITH GARLIC POWDER, PLACE IN A 325 DEGREE PREHEATED OVEN, TOAST FOR 5 MIN. I was disappointed with this recipe. The sauce was so soupy and I thought both the sauce and the meatballs were a little bland. 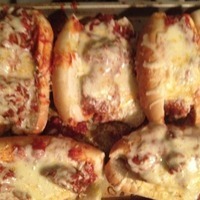 This came out soupy for me also......it is good though, just maybe not for the meatball subs like in the picture. I pinned this awhile ago and finally got around to making it. And well... it was absolutely terrible. Everyone hated it. It was bland, soggy and not tasty at all. I ended up using up the leftovers by chopping up the meatballs and pan frying them with onions and topping with cheese. Absolutely terrible. A word to the wise, don't waste your ground beef on the recipe. So disappointing. I am making this for my boyfriends daughters birthday party!! I like this.....hope to try soon. I fixed these yesterday, and they were a hit! I changed a few things up, I used ground turkey meat, and used 2 1/2 lbs (I have a big clan!). I also added fresh herbs (parsley, oregano, basil) to meatballs. I used 4 eggs, and eyeballed extra breadcrumbs. I also added extra garlic, and put in a little chili powder and paprika. I kept wine amount the same, and added a cup of marinara at the end of cooking. The consistency was good! I suggest playing with it a bit, you really can't mess it up! Delicious over crusty bread!